Perhaps the most important question you need to ask yourself is: “What’s my adventure?” By this I mean, where are you going to be using the lights and what type of off-roading will you be doing most with the lights? There are many different type of off-roading and some lights are better suited for certain activities than others. For example, will you be flinging sand at the dunes or ripping through whoops in the desert? Are you going to be rock crawling or traversing your favorite tight bush tracks? As you can imagine, the lights needed for high-speed wheeling in the desert could be much different from what’s needed for more moderately paced off-roading on gravel tracks and overlanding adventures. High-speed (80+ KM/H) – For those of you that regularly are off-roading in high speed scenarios, you’re going to want lights that illuminate objects across far distances and will need short, mid, and long range lighting. Low-speed (0-25 KM/H) – If you’re the type that’s more into rock crawling or putting your driver skills to the test with challenging technical trails, short range, full peripheral lighting will be your ultimate target. Somewhere in between – If you’re in-between these two categories, don’t worry! You fit into the group that regularly traverses on Forest Service trails, does a lot of overlanding, or sometimes enjoys a little high-speed action interspersed with rock crawling sections. If this is you, you’re going to want short to mid range lighting that offers versatile lighting balance for most driving needs., with the option of adding some long range lights if you determine you need them. What type of light should I get? Halogen, HID or LED? Below is a quick list of pros and cons for each type of lighting that you’ll see when searching for off-road lights. We are going to have another blog post coming out soon that dives into each of these a little bit more, so check back for that! In summary, if you’re looking for a light with good performance at low cost, you’ll probably be looking at halogens. If you want the ultimate light with the best lux value per watt and want to light things up that are really, really far away then HIDs will be best for you. If you fall in between these and want a light that is affordable and delivers great performance while being incredibly durable and efficient, then start looking at LEDs. In short, not necessarily. Lumens is best described as a base metric that we use to indicate the total potential amount of light from a light source. This potential light emitted is subject to various factors like electrical efficiency and optical efficiency, meaning that raw potential doesn’t always equate to real-world, usable light output. It is up to the light manufacturer to best harness and control that light potential. Specially when looking at LED lights, many specify raw lumen ratings. This is simply the theoretical maximum potential, which comes from the rating of each individual LED chip being multiplied by the total number of chips. The actual measured output or effective lumens of the light may be much less than the raw lumen count given. It’s for this reason that we place more emphasis on measuring effective light output using lux and candela. Lux and Candela are more practical ways to measure the performance of lights. Lux and candela help us measure the strength, intensity and volume of light at a fixed specific distance. Typically Lux is the measured light intensity onto a surface area of one square meter at a fixed distance of 10 meters. Candela is the total volume of light within a certain beam angle and direction. Lumens, lux, and candela should all be used in conjunction to assess the performance and luminous efficacy of lighting products. Why are some lights more expensive than others? There are many variables that go into the cost of a light, but many of those variables can be clumped into either the technology that is packed into that product or the quality of the materials that the light is composed of. Of course there are many other factors such as the research, design, manufacturing costs, etc. but the biggest ones that matter to you, a consumer, are the ones we’re going to cover here. As mentioned earlier, some lights produce electromagnetic interference (EMI) or radio-frequency interference (RFI), and this must be accounted for. A really high quality light will have integrated EMI and RMI blocking and filtering technology that provides interference transparency and PCB electronics stability. Additionally, thermal management is also an important feature that helps separate some lights from others and this can be anything from specially designed cooling fins on lights, to on-board digital management that can recognize when a light is overheating and can thereby throttle the output or auto-shutoff to prevent damage to the product itself. The quality of the products themselves is another major factor that cost is dependent on. For example, higher end lights will have precision injected reflector optics in order to maximise the efficiency and beam control of the light itself. The quality of a lighting product must be considered in every aspect, from lights that have shatter-proof Lexan lenses to IP rated die-cast aluminum housings to stainless steel hardware and everything else in between. What's the best bean pattern and what are their differences? Picking a beam pattern is very subjective, and it often boils down to what your use will be. For that reason, the best beam pattern for you might be vastly different than the ideal beam pattern for someone else. In general, you are aiming for the most balanced, overall lighting configuration, which is a blend of some of these beam patterns. You wouldn’t want only spot pattern lights on your vehicle as you wouldn’t have great short range and peripheral illumination, conversely you also don’t want only fog beams because then you wouldn’t see objects you’re approaching that are farther away at longer distances. Here’s an explanation to some of the most common beam patterns and what their best uses are for. Fog Beams: A true fog beam projects a beam pattern that is very wide horizontally (often 135 degrees or wider) but has a sharp vertical cut-off. Fog lights are intended to be mounted below the headlights (e.g. 25-60cm above the ground) and are designed to shine below layers of fog, rain, snow, and even dust. This pattern lights up a pathway close to the ground but does not light the airborne particles in the line of sight while driving. These also only illuminate a short range distance from the vehicle and will not throw light very far. If you’re often driving in foggy, rainy, snowy, or dusty conditions, then fog beam light will greatly benefit your visibility. Wide-40 Beams: Lights that feature a Wide-40 beam are a hybrid between a fog beam and a driving beam light. They have a wide pattern, but also have increased brightness and light distance compared to a fog light pattern but do not have quite as much distance as a driving beam light. These are typically not street legal so they are a good option for you if you want something for off-road use only that has a very bright, and wide beam. Driving Beams/Spread: Lights with a driving beam pattern are designed to supplement your high beam headlights and illuminate a path much further down the road. Driving Lights produce a rectangular shaped beam pattern that can reach further and wider than your headlights. Sometimes, depending on the manufacturer, a light with a driving beam pattern is not street legal and therefore cannot be used on roadways and when there is oncoming traffic. Driving lights are very useful to create visibility near the sides of roadways and areas directly in front of the vehicle. They are great for all around trail riding as well. Spread beam lights are similar to driving beams but tend to be brighter, wider and sometimes taller as they are not required to follow specific SAE or ECE safety standards. Spread beam lights are great lights for multi-purpose off-road use and offer versatile, balanced lighting. Spot Beams (Long Range): Spot or Long Range lights are able to penetrate deep into the night. Lights that have a spot beam pattern produce a tighter, more focused circular beam of light (often called a pencil beam) that reaches far down the road to see way out ahead toward the horizon even at higher speeds. Because this light pattern is very narrow, there is not much light on the sides. Spot beam lights are best when paired with other beam patterns to fill the areas closer to the vehicle, for a complete area of light beam coverage. Vital to the performance of these lights is where they are aimed. Flood Beams: Flood beams are nearly the opposite of a spot beam and they create a wide, evenly distributed pattern of light that floods an area with an extremely tall vertical and wide horizontal light pattern. 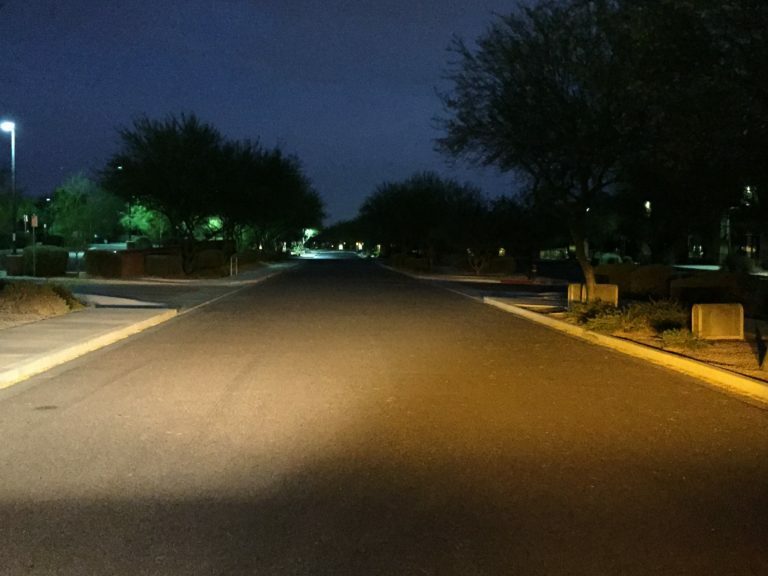 Due to the light being evenly distributed across a large area, they often are not very intense which proves beneficial in reducing glare when reflected off nearby objects around the vehicle.These lights are typically used as work lights, scene lights, and back-up lights to see a broader area at shorter distances. Construction and agricultural type vehicles often use these types of lights. Is an amber or white light better? In some conditions, and amber light will perform better but in other conditions a white light will perform better. This question really comes down to if you’re ever off-roading in the conditions where an amber light could prove beneficial. Generally speaking, an amber light will excel in dusty, foggy, rainy, or snowy conditions as they appear to cut through airborne particles much better than a more intense, white light does. However, a white light often appears much brighter even if they have the same power output. Amber and white lights are different simply in their color temperature, which is how the perceived color of light is measured. Color temperature is most commonly measured in terms of degrees Kelvin (K). Lower values of around 2500-4000K appear more yellow/amber (warm) and higher values of 4000-7000K begin to appear white and even into the blue/violet range at the upper end (cool). Higher color temperatures have shorter wavelengths, which results in light bouncing off/reflecting off of particles in the air causing poorer visibility in dust, fog, rain, or snow. For the most balanced lighting setup, a combination of amber lights and white lights is best — or at least having the option to turn your white light into an amber light with a clip-on transparent cover, etc. So what are the differecnes between the KC HiLiTES products? We offer a huge assortment of lights here at KC HiLiTES Australia and despite what seems overwhelming at first, our goal is to burden you with endless options!, We have so many options because the “perfect light” for one person, may not be the “perfect light” for someone else. The perfect light will depend on many criteria for each person including: budget, light type, physical size, beam pattern, light output, and so on. The KC Team is always here to help you pick the right KC light, so here is a quick guide that covers our different offerings. If this doesn’t quite help you out enough, feel free to give us a call 1300 462 362 or shoot us an email by clicking here! THE ULTIMATE BUYER’S GUIDE TO OFF-ROAD LIGHTING TO ENSURE YOU MAKE AN INFORMED DECISION.